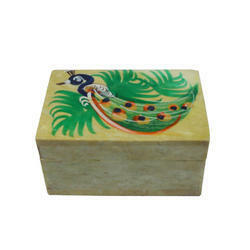 Beautiful Indian Handmade Paper Mache Egg Box, Handpainted with Perfection. This can be customized as per your painting pattern requirement and color combination. Avail from us the precious Brass MOP Mother of Pearl Tortoise for décor as well as gifting purpose. The exclusive collection of Brass Tortoise that we offer is available in numerous sizes and designs. We have acquired huge appreciation from the clients for offering the matchless products. Provides buying and sourcing services for all kinds of trinket box, jewelry box, decorative picture and perfume bottle. Need a new place to keep your jewelry Are your necklaces and rings just sitting out on your dresser Do yourself a favor and buy a new Palm Leaves gift box from our marketplace! These Palm Leaves keepsake boxes are made from real palm leaves , coloured with lead free colours. We have wide range of Lac Decorative Products like pens, penholder, photo frame, mirror, diary, key holder & pill boxes. These Lac Decorative Products are hand decorated using beads, mirrors, and sequins, which reflect true craftsmanship. Our attractively designed Lac Decorative Products can be gifted to someone special and can be placed in living room. Trinkets may not hold the same value as some of the other jewels but that doesnt mean you wont take care of them. We bring to you a wide variety of trinket boxes to store your trinkets, jewels and other collectibles. Hand painted in Kashmir by the masterful artisans, our trinket boxes come in rich, bright and vibrant colors. The decorative wooden box trinket box is beautiful box, nice for wedding gifts and great to keep jewelry in a proper way. With a few simple materials such as ribbon, lace, sequins and buttons, use your ingenuity to create amazingly personal yet professional-looking gift and trinket boxes. As you work with them, take more liberties with these designs and ideas and make great gifts which are sure to delight and astound many a lucky recipient. Glitter Decorated Trinket Boxes are available in Round Shape , Heart Shape, etc. Trinket boxes to keep order on the dressing table and are made in different designs, sizes and colours. These trinket boxes are made of handcrafted paper mache, eco friendly to the highest standard, some with generous amounts of 22K gold highlights(on demand). The quality in these pieces is evident the moment you see the lavish glaze, gilt and rich colouration. when grouped together they make a gorgeous display. Highly collectible and make a beautiful gift. 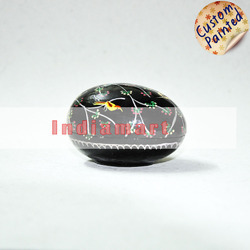 Exquisite Indian handicraft used to design these eye catching trinket box a must have in each house hold.